Hilaree is a professional mountaineer and North Face team member. 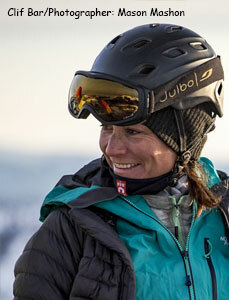 Her mountain adventures led Outside Magazine to name her one of the most adventurous women in the world of sports. She has repeatedly made a mark in the Himalayas. In 2005, she made the 2nd female oxygenless ski descent of the 8000m peak Cho Oyu in Tibet. In 2012 she climbed both Everest and its neighbor Lhotse, making her the first woman to climb consecutive 8000m peaks in a single day. As the recipient of a National Geographic Explorer’s Grant, Hilaree led a team of alpinists to attempt a first ascent on a remote peak in northern Myanmar in 2014. The film about the adventure, Down to Nothing, won the Best Cinematography Award at Telluride’s Mountainfilm in 2015. Most recently, Hilaree attempted another Himalayan giant, Makalu, which was named by Outside Magazine as one of the “Most Badass Adventures of 2015”. Between expeditions, Hilaree spends her time as a mother, adventuring with her two sons ages 6 and 8. Hilaree also shares her stories through motivational speaking engagements across the country.